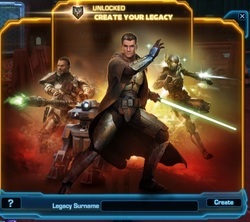 This week BioWare updated Star Wars: The Old Republic with the first parts of their legacy system. A quick review of this system for those not familiar with it is the legacy system allows work on one toon to carry over to your other toons. One example of this is a bounty hunter's buff would be added to a sith inquisitor's buff. But this got me wondering, what is my gaming legacy? I have spent a good chunk of my life playing video games. It started during family night with the Atari; then moved in to hunting ducks and saving a princesses whom was always in another castle. Since then things have evolved. Now I am the defender of Skyrim, the hero of time, the, savior of the galaxy, and scourge of The Republic. But does this make my legacy? Is my gaming legacy the measure by the games I have played, or is it the sum of my actions in these games? I would like to think that a gaming legacy is a mix of these. Especially since most older games in the past did not have a way for you to shape your character as games today do (Fable and inFamous for example). They were, for the most part, very linear games. Combining the two my gaming legacy is a summed up as a man from another place. I am known for my heroic and selfless acts. I have abilities that few others can match, and I use them wisely. I am not good at sports nor at racing, but I will make the hard decisions for the greater good. What is your gaming legacy? Are you the number one sports hero? Have you placed first in every race you have been in? Or are you the scourge of everyone's existence?